Radio the way it’s supposed to be. That always has been the guiding principle of Tom Perryman, the 2013 TAB Pioneer of the Year. His radio career spans 66 years -- from the heyday of live radio through many decades of market and technological changes. 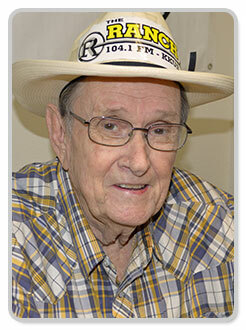 At 86, Perryman still maintains a busy schedule as DJ and promoter of classic country artists on KKUS-FM 104.1 The Ranch, a station of the East Texas Radio Group in the Tyler-Longview market. Perryman’s show and his on-air promotional skills have moved KKUS to the top of the ratings, while contributing to the entire group’s financial stability. The radio bug bit Perryman at age 16 when back surgery confined him to bed for several months at Rural Shade, his farming home in southeastern Navarro County. The teenager listened to great announcers on popular AM stations and dreamed of being on the air. Perryman earned an FCC first-class radio operators license at Tyler Commercial College, then fulfilled his dream in 1947 by signing on at KEBE-AM in Jacksonville. “I went from picking cotton to picking records,” he likes to say. “Texas Tom,” as he was known, hosted “The KEEBIE Korral” request hour, playing hillbilly music and telling stories about country life, a formula that served him well throughout his career. “The station owner, Bill Laurie, told me, ‘If you can’t whistle it, don’t play it,’” Tom recalls, “and that stuck with me.” Perryman promoted his first traveling Louisiana Hayride show in 1948, a success that filled Jacksonville’s football stadium. From 1949 to 1956, Perryman worked at KSIJ-AM in Gladewater, eventually becoming station manager by his mid-20s, during the formative years of country music. He hosted “The Hillbilly Hit Parade,” which featured appearances by promising young musicians—including Elvis Presley - who traveled Highway 80 between Shreveport and Dallas. He helped launch Elvis’s career by booking him at shows throughout East Texas. Perryman’s career jumped from a small market to the biggest country station in the nation when he became the first regular DJ of an all-night country music show on WSM in Nashville. He hosted the “Opry Star Spotlight” from 1956 to 1958, featuring music and interviews with top Opry artists. He also coordinated the Opry Artists Service Bureau, arranging with managers and buyers for artists’ appearances. Perryman and his wife, Billie, returned to East Texas in 1959 as co-owners with country singer Jim Reeves of KGRI-AM/FM in Henderson. They turned it into one of the nation’s first town-and-country format radio stations. The station promoted future greats such as Johnny Cash and the Browns. Reeves died in 1964 in a plane crash, and in 1967 the Perrymans, along with Reeves’ widow Mary, bought WMTS-AM/FM in Murfreesboro, near Nashville, Tenn. The station was a founding organizational member of the Country Music Association. The Perrymans and Mary Reeves sold the popular station in 1978, and Perryman became vice-president of Jim Reeves Enterprises. To keep the Reeves legacy alive, Perryman produced an award-winning radio documentary about Jim Reeves’s influence on country music, in addition to a video showcasing Gentleman Jim’s music. He also promoted and produced records for Cajun-Country star Jimmy C. Newman and others. By 2001, Perryman was back in East Texas, turning KKUS-FM into a consistently high-rated classic country station. “The Ranch and my 9-to-11 morning show dominate the older demographic. These folks grew up with the people I play, and they can’t get that format anywhere else. The younger listeners are hearing this kind of music for the first time, and they’re loving it,” Perryman says. As a DJ, promoter and station owner in the East Texas and Nashville markets, Tom Perryman joined other radio pioneers in helping develop a growing national appetite for what became country music. These changes led the way in the development of today’s entertainment industry. “But I’ve always remembered that you don’t own the airwaves. You have the honor of broadcasting to serve the public,” Perryman says. Pioneer broadcaster and DJ legend Tom Perryman has been inducted into the National Country Music Disc Jockey Hall Of Fame and the Texas Western Swing Hall of Fame, and has received the Texas Country Music Hall of Fame DJ Award and the East Texas Tourism Association Broadcaster of Year award, among many others.